Few people would disagree with the statement that Uncle Tom's Cabin has been both a progressive and a reactionary force in American culture. The problem is accounting for how one text can have such a varied political text. Or, perhaps that is the wrong question. What if Uncle Tom's Cabin is thought of as many texts? That is to say, what if we think of Uncle Tom's Cabin not just as a novel created by an author, Harriet Beecher Stowe, but as a text created and recreated by readers, adapters, and even those politically hostile to Stowe? Then there would be an obligation to consider those texts that responded to or made use of Uncle Tom's Cabin as in themselves significant. Too often these texts (other novels, plays, poems, songs, advertisements, newspaper reports, letters to the editor, etc.) are only given attention as a reflection of the popularity or impact of Stowe's novel. But they can also be viewed as the very means by which Uncle Tom's Cabin assumed importance in American culture, as what began as Stowe's novel was taken up by others and interpreted, reconsidered, and, to use the term central to this argument, articulated. The character of Topsy, as she was constructed by Stowe and subsequently reconstructed by others, illustrates how disparate cultural elements can take on a range of political and social meanings. Stuart Hall's definition of articulation provides the most helpful guide to this approach. As a concept, articulation has a much more obvious connotation in England because of the popular term "articulated lorry," which refers to what in the U. S. is called a "tractor trailer truck." Articulation in this sense refers to the manner in which the trailer section can be detached and hooked up with different tractor sections. 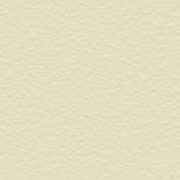 Despite the non-necessary correspondence between these two parts, the combination would be referred to as a truck. However, "truck," from this perspective, needs to be seen as the articulation of two separate elements into a unified construct. Articulation describes the means by which cultural elements can be joined together as well as the contingent nature of those linkages. Hall insists that there is nothing essential in these cultural combinations (just as a trailer section can be moved onto any truck), but that under certain conditions specific combinations are most likely and have something to tell us about the nature of those conditions. In short, material conditions matter, even if they do not "determine" in the traditional sense. Following Raymond Williams, Hall has insisted that "[m]aterial circumstances are the net of constraints, the ‘conditions of existence' for practical thought and calculation about society"* The important work to be done by theorizing lies not in predicting outcomes, but in establishing what action to take (or what action could have been taken) given a set of circumstances. 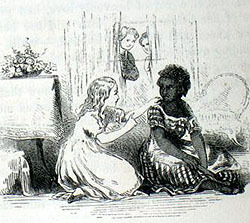 The advantage of the concept of articulation in the context of Uncle Tom's Cabin is that it allows an examination of Stowe's novel as part of a cultural pattern, not as an isolated creative act. Stowe's novel put into combination a series of cultural elements (including religion, slavery, melodrama, and family crises), but those elements then became available for reinterpretation and re-articulation, as becomes apparent in an examination of the long, varied history of representations of one of Stowe's most popular characters, Topsy. It would be wrong to consider Stowe's Topsy as the "authentic" creation that was simply degraded by those making use of her after Stowe. The character of Topsy began as a combination of different cultural elements. Within Stowe's Topsy can be found elements of minstrel stereotypes, the trope of the "wild child," and anxiety about the working-class. When St. Clare first introduces Topsy he says, "I thought she was rather a funny specimen in the Jim Crow line" and tells her to "give us a song, now, and show us some of your dancing. "* Topsy's routine, consisting of spins, claps, odd singing and a concluding somersault, was to be substantially enhanced in subsequent theatrical performances. However, the minstrel element already in the Topsy of the novel was there for later adapters to re-articulate, in this case back into the tradition from which she had partially "grow'd." The wild child, separated from her mother and mistreated, was a familiar trope in sentimental fiction. In fact, Stowe's solution for the problem of a wild child, the love of a substitute mother, was by no means unusual. 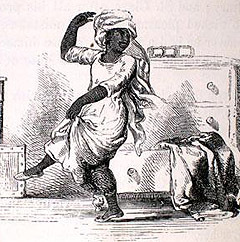 * What was unique was Stowe's conflation of the wild child with the slave child. This act of articulation made a specific political use of the wild child trope by literally making slavery responsible for an ongoing concern of white, middle-class America, the motherless child in an economically uncertain world. As Christine Stansell has shown, shifts in employment practices as well as population increases in the 1850s led to a growth in the phenomenon of children separated from their parents and often on their own on the streets. "[L]arge numbers of children, who two decades earlier would have worked under close supervision as apprentices or servants, spent their days away from adult discipline. "* Stowe's Topsy made a particular kind of sense under these conditions. 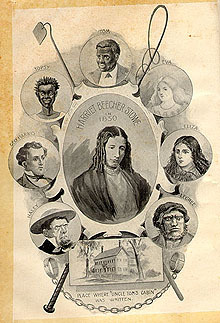 In fact, Stowe was to later argue in A Key to Uncle Tom's Cabin that the "problem" of Topsy was not specific to slavery. In the Key, she refers to the English working class and New York City prostitutes for whom educational and reform efforts were designed to "encourage self-respect, and hope, and sense of character. "* Such methods are seen to apply to these populations in the same way they were to be applied to children like Topsy. 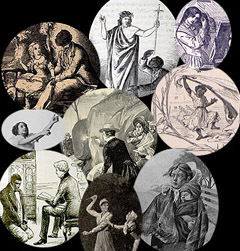 By placing Topsy's condition alongside these cases, Stowe tapped into her readership's already existing concerns and available cultural narratives (including stereotypes), and then directed them all toward slavery. As a character without a personal narrative, Topsy has little to guide and shape her actions. Topsy infuriates Ophelia by stealing small household items, such as gloves, ribbons, and earrings. Yet, the objects mean nothing to Topsy. When Ophelia tells her to admit her thefts or face a whipping, Topsy confesses to all she took and, for good measure, admits to taking Eva's necklace as well, even though it had never been stolen. Similarly, Topsy's random appropriation of behaviors from others can be seen as a substitute for her lack of a personal narrative. "Her talent for every species of drollery, grimace, and mimicry--for dancing, tumbling, climbing, singing, whistling, imitating every sound that hit her fancy--seemed inexhaustible. "* Yet this talent, like the objects she takes, fails to influence her actions meaningfully. The problem of Topsy, as presented by Stowe, is that she is a character without character, a site where different discourses converge, but which have no influence in shaping her. Topsy's subsequent story concerns how Eva's individual affection gives her a narrative and a past. When Eva confronts Topsy about her behavior she learns that Topsy has no one who personally cares for her. Eva then tells Topsy, "I love you, because you haven't had any father, or mother, or friends;-- because you've been a poor, abused child! I love you, and I want you to be good. "* Topsy's change (marked by the tears she cries in response) begins at the moment of Eva's individualizing attention. Her conversion is cemented by Eva's deathbed gift of a lock of her blond hair. Following Eva's death, Topsy is once again accused of stealing. However, when confronted, it turns out she is hiding a book of Eva's given to her as a gift, one of Eva's curls and a strip of black crape leftover from Eva's funeral. When Topsy fears these items are to be taken from her, she pleads with Ophelia to let her keep them. In their relation to Eva, these almost fetishized elements are linked to the change in Topsy's behavior. "Topsy did not become at once a saint; but the life and death of Eva did work a marked change in her. "* The objects become the building blocks, for Topsy, of the personalized narrative whose absence so acutely marked her pre-conversion state. The change in Topsy serves to illustrate the difference between an arbitrary collection of cultural elements and a collection informed by a governing narrative. It is, for Stowe, as if Eva's intervention moves Topsy from caricature to character. Articulation is by definition a contingent act. Elements brought together in the character of Topsy could be re-articulated in different situations. In fact, the history of the Topsy figure illustrates what could be called "the return of the articulated." Topsy's character as written by Stowe was both to be laughed at and sympathized with, befitting a creation that drew on both the minstrel and the sentimental tradition. 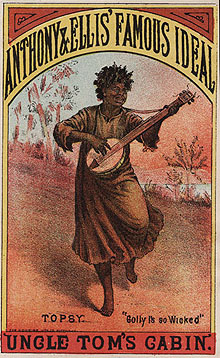 But as Topsy became part of popular culture, particularly in stage versions of Uncle Tom's Cabin, the minstrel aspect of her character came to define her more than the sentimental aspect. In this case, as laughter replaced tears, representations of Topsy began to do quite different cultural work. In Stowe's novel, Ophelia convinces St. Clare to sign over ownership of Topsy to her, so she can take her to Vermont and free her. Topsy leaves the novel once the story proceeds down river to Simon Legree's plantation. In contrast, Aiken continues the story in Vermont with the addition of the character of Cumption Cute, a distant relative of Ophelia's who attempts to swindle her out of money. When Cute arrives at Ophelia and Topsy's Vermont home, his initial exchange with Topsy provides the ugliest comedic racism in the play as he refers to Topsy by a number of epithets and suggests exhibiting her as a Barnumesque curiosity. Topsy, though she doesn't entirely understand Cute's offer, refuses to leave. Her decision is supported by Ophelia who tells Topsy, "you know you are very comfortable here--you wouldn't fare quite so well if you went away among strangers. "* Eventually, Cute is driven out of their house by Ophelia, accompanied by a broom-wielding Topsy in a bit of slapstick humor which would not be unfamiliar in a minstrel show. For Stowe, Eva's impact on Topsy set in motion a process of erratic, but measurable change. 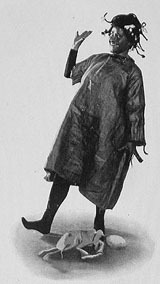 However, in Aiken's adaptation as in most other dramatic versions, the changes in Topsy did not shift her from caricature to character. At the end of the play, she still remains the figure of humor she was at the beginning. It was through the lens of minstrelsy that many theater patrons viewed the character of Topsy. Furthermore, at a time when the theater was defined as a largely masculine sphere, the case of Topsy did not speak to male economic insecurity with the same force that it spoke to women concerned about the motherless children of the new economic order. These contrasting portrayals of Topsy can also be seen in two visual representations. 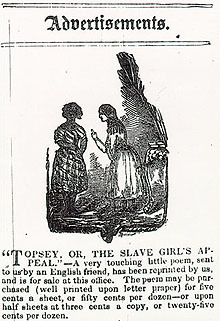 The first comes from an advertisement in Frederick Douglass' Paper for a poem entitled "Topsey, [sic] or, the Slave Girl's Appeal" (see left). In this picture, Topsy stands in a demure, straight-backed pose with her hair neatly combed, her toes pointed and her hands folded in front of her. Her dress, though not as refined as Eva's, is not out of keeping with middle-class, nineteenth-century fashion. Compare that picture with the promotional postcard portrait of Topsy from a dramatic production (see right). In this representation, Topsy sings and dances while playing a banjo. Her crude dress is ill-fitting and her hair unruly. The first image, though it displays an obvious sympathy for Topsy, also suggests models of behavior and physical beauty for Topsy based on white, middle-class ideals. In fact, the ability of Topsy to achieve those ideals appears to be at the heart of the "slave girl's appeal." Eva's hectoring gesture with her finger is one sign of the disciplining procedure by which it is understood that Topsy could be brought into conformity with white, middle-class standards. As troubling as that figure may be, the second Topsy is more problematic. It suggests that the dominant image of Topsy is not, as in the prior figure, that of a child who can be reformed, but rather of an incorrigible imp. Topsy's wildness, as this picture illustrates, made her a popular part of the plays. According to Harry Birdoff, Topsy was the big draw when touring companies went through the west after the Civil War. As performances of the play developed, additional songs were written for Topsy. 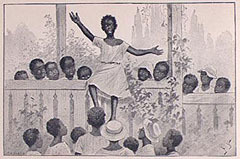 "I'se So Wicked" had been her signature tune as early as the Aiken plays, but as music came to play a larger role in performances, Topsy began singing additional songs such as "Bekase My Name Am Topsey [sic]." During the period when performances of Uncle Tom's Cabin had increased in scale in order to compete with circuses and Wild West shows (the main competition for acting troupes of traveling "Tommers"), Topsy was one of the prime characters to be "doubled" during the Double Mammoth performances of the 1880s. If Topsy's frenetic dancing was already a hit, having two Topsys on stage was thought to be an even bigger selling point. This dancing took on sexual connotations after the success of the suggestive routines of "Little Egypt" at the 1893 Columbian World's Fair. Following suit, Topsy's breakdown during the 1890s began to take on insinuating overtones. The most lasting image of Topsy, however, is in her contrast to Eva. 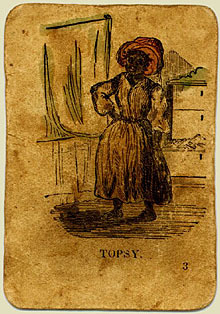 While the image of the advertisement from Frederick Douglass' Paper emphasized continuities between Eva and Topsy, the image of Topsy which came to dominate placed her in direct contrast to Eva. While Eva was portrayed typically as refined, demure and very white, Topsy was represented as crude, immodest and very black. This binary opposition was literalized when the popular Topsy-Turvy doll (which pre-dated Uncle Tom's Cabin) was made into the Topsy/Eva doll (Figure 11a). 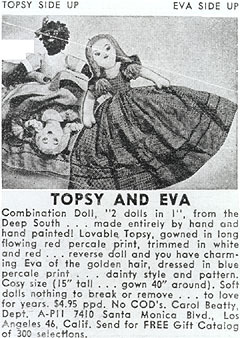 This doll could be either character -- "Lovable Topsy" or "charming Eva" according to the advertisement copy-- depending on which side of their shared dress was flipped up, but the advertisement itself illustrates the unevenness of this "sharing." In the photograph of the doll, Eva is at the center. Her eyes face the viewer and her "dainty" blue dress takes up much of the right side of the photo. Topsy is pushed off into the upper left hand corner. Her eyes look off into the distance and her dress is folded up so as to show the head of Eva. Shirley Samuels and Karen Sanchez-Eppler have written about this doll as both illustrative of the representation of racial differences under segregation and suggestive as to the instability of those differences. * However, as a lasting image, what is significant is that the relationship between the white Eva and the black Topsy structured representations of white and black girls into the twentieth century. Most significantly, Shirley Temple's screen persona drew greatly upon the culturally available images of the precocious Eva. This debt was acknowledged directly in Dimples (1936), in which Temple played a child actress who starred as Eva in the first production of Uncle Tom's Cabin. [CLICK HERE TO VIEW IN VIDEO FORMAT] An even more pertinent Temple movie was The Littlest Rebel (1935), a film set in the antebellum South. 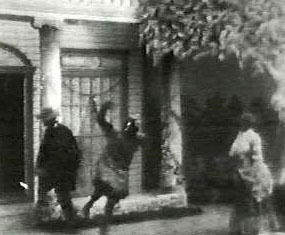 * In one scene, Temple is presented with a gift by a young black girl who dressed in the typically ragged clothes of a Topsy figure. When the young girl begins to make a speech to Temple, the girl becomes flustered and starts to cry. Temple consoles her and thanks her for her generosity. The kindness and assurance of Temple is contrasted to the awkwardness and insecurity of the young black girl. The dynamic of Eva and Topsy is replayed, only now the relationship between the angelic while girl and the unrefined black girl has been universalized. Within this context, a scene in Toni Morrison's The Bluest Eye (1970) takes on particular relevance. Claudia, Morrison's protagonist, is an adolescent African American girl with a fierce hatred of Shirley Temple. While Claudia's sister and their friend find Temple cute, Claudia despises her and can only think of the actress in the context of a Shirley Temple doll she had been given as a gift. Claudia has no love for this doll, though she is curious as to why this particular representation is so universally admired. Her curiosity leads her to dismember the doll. Of course, the dismemberment of the doll--Claudia explores and then destroys its face, hair and features--is an act of violence as well as curiosity. In the ideals of the Shirley Temple doll, Claudia finds societal standards that only make her feel worse about herself and make her hate white girls. Psychologically, the Shirley Temple doll still shares a dress with Topsy. The doll's beauty and grace implicitly is contrasted with the ugliness and awkwardness that Claudia is made to feel about herself. If it seemed as if "all the world agreed" on this ideal, that was because it had a long history. The figure of Topsy remained a dominant representation of African American girls, but what that representation signified varied greatly over time and by its particular articulation with other practices and ideologies. While Topsy could evoke sympathy and stand as a symbol for the potential for growth in even the most severely abused children, she could also be a model (literally a "poster-child") for racist ideologies. A character of conflicting elements from the start, Topsy's history illustrates the way in which an iconic figure can become rearticulated to differing agendas. To speak about the significance of Topsy requires one to consider what kind of Topsy is being represented and to what ends. New Literary History 31.3 (Summer 2000): 573-97. 1. William McDonald; 3, 4 & 6. Clifton Waller Barrett Collection, Univ. of Virginia; 5. Univ. of Wisconsin Library, Rock County Campus; 6a, 10 & 11a. Harry Birdoff Collection, Harriet Beecher Stowe Center, Hartford; 7. Special Collections Dept., Univ. of Iowa Libraries, Iowa City; 9. Special Collections, Univ. of Virginia: Purchased with funds from the Robert and Virginia Tunstall Trust; 12. © 1935 Twentieth Century-Fox; 13. John Hay Library, Brown Univ.